Kittinger jumping from the Excelsior III balloon gondola in 1960 before free-falling toward Earth for over 4 minutes. Joseph Kittinger is a retired United States Air Force pilot who pioneered balloon jumps from the edge of space. Among his many exploits, he jumped from an open balloon gondola at 102,800 feet (over 31 kilometers) – the highest a human being has ever traveled in an unpowered flight. He plummeted toward Earth for almost 26 kilometers before his main chute opened, in the longest free fall in history. At one point he radioed back, "There is a hostile sky above me. Man may live in space, but he will never conquer it." Kittinger grew up near Orlando, Florida, and became fascinated with planes at a young age when he saw a Ford Trimotor at a nearby airport. As a youth, he persuaded local pilots to give him free rides, and he soloed in a Piper Cub by the time he was 17. Kittinger attended the University of Florida for two years, then left to join the U.S. Air Force in 1949 as an aviation cadet and earn his wings. He served as a NATO test pilot in Germany until 1953, when he was assigned to the Air Force Missile Development Center at Holloman Air Force Base in New Mexico. At Holloman, Capt. Kittinger flew experimental jet fighters and took part in aerospace medical research. In 1955, he flew the T-33 observation plane that monitored the rocket-sled experiment of aircraft medicine pioneer John Stapp. 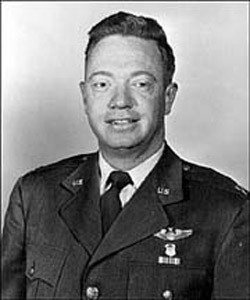 Stapp recruited Kittinger for Project Manhigh, which began in 1955 and would use balloons capable of high-altitude flight and a pressurized gondola to study cosmic rays and to determine if humans were physically and psychologically capable of extended travel at space-like altitude (above 99% of Earth's atmosphere). The Air Force had determined that a high-altitude balloon flight was the best way to conduct these studies since aircraft could remain at these altitudes for periods of time that were too short to provide useful data. Using a two-million-cubic-foot (56,634-cubic-meter), 172.6-foot (52.6-meter) diameter balloon and a cramped aluminum alloy capsule manufactured by Winzen Research of Minneapolis, Kittinger made the first Manhigh ascent on June 2, 1957, remaining aloft for almost seven hours and climbing to 96,000 ft. (29,261 m). The lessons learned from his flight and two other Manhigh flights later in 1957 and in 1958 by Major David Simons and Lt. Clifton McClure that went even higher and set new records were used later in Project Mercury. In 1958, Kittinger moved to the Escape Section of the Aeromedical Laboratory at Wright Air Development Center's Aero Medical Laboratory. There, he joined Project Excelsior, which investigated the use of a parachute for escape from a space capsule or high-altitude aircraft. At the time no one knew whether humans could survive a jump from the edge of space. On November 16, 1959, Kittinger piloted Excelsior I to 76,000 feet (23,165 meters) and returned to Earth by jumping, free falling, and parachuting to the desert floor in New Mexico. The jump almost cost him his life. 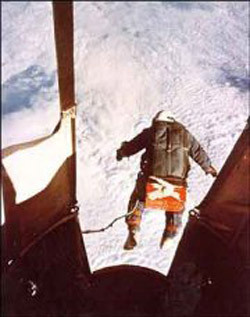 His small parachute, which served to stabilize him and prevent him from going into a fatal 'flat spin,' opened after only two seconds of free fall instead of 16, catching Kittinger around the neck and causing him to spiral uncontrollably. Soon he lost consciousness, as he tumbled toward Earth at 120 revolutions per minute. Only his emergency parachute, which opened automatically at 10,000 feet (3,048 meters), slowed his descent and saved his life. In spite of his close call, he continued with the project and the flight of Excelsior II, which took place on December 11, 1959. This balloon climbed to 74,700 feet (22,769 meters) before Kittinger jumped from his gondola, setting a free-fall record of 55,000 feet (16,764 meters) before pulling his parachute ripcord. The next year, Kittinger set two more records, which he still holds. On August 16, 1960, Kittinger surpassed the altitude record set by David Simons, who had climbed to 101,516 feet (30,942 meters) in 1957 in his Manhigh II balloon. Kittinger floated to 102,800 feet (31,333 meters) in Excelsior III, an open gondola adorned with a paper license plate that his five-year-old son had cut out of a cereal box. Protected against the subzero temperatures by layers of clothes and a pressure suit – he experienced air temperatures as low as minus 94°F (minus 70°C) – and loaded down with gear that almost doubled his weight, he climbed to his maximum altitude in 1 hour and 31 minutes even though at 43,000 feet (13,106 meters) he began experiencing severe pain in his right hand caused by a failure in his pressure glove and could have scrubbed the mission. He remained at peak altitude for about 12 minutes; then he stepped out of his gondola into the darkness of space. After falling for 13 seconds, his six-foot (1.8-meter) canopy parachute opened and stabilized his fall, preventing the flat spin that could have killed him. Only 4 minutes and 36 seconds more were needed to bring him down to about 17,500 feet (5,334 meters) where his regular 28-foot (8.5-meter) parachute opened, allowing him to float the rest of the way to Earth. His descent set another record for the longest parachute free-fall. During his descent, he reached speeds up to 614 mph, approaching the speed of sound without the protection of an aircraft or space vehicle. But, he said, he "had absolutely no sense of the speed." His flight and parachute jump demonstrated that, properly protected, it was possible to put a person into near-space and that airmen could exit their aircraft at extremely high altitudes and free fall back into Earth's atmosphere without dangerous consequences. After Excelsior, Kittinger moved on to Project Stargazer, which began in January 1959. This balloon astronomy experiment studied high-altitude astronomical phenomena from above 95% of Earth's atmosphere. This vantage point allowed undistorted visual and photographic observations of the stars and planets. On December 13–14, 1962, Kittinger, along with astronomer William C. White, rose to an altitude of 82,200 feet (25,055 meters) and hovered over Holloman Air Force Base in the Stargazer gondola. The two checked variations in the brightness of star images caused by the atmosphere and made observations by telescope. The flight also provided useful information about the development of pressure and associated life support systems during an extended period on the edge of space. This was Kittinger's final high-altitude balloon flight. Kittinger volunteered for three combat tours in Vietnam, flying 483 missions. On May 11, 1972, he was shot down and spent 11 months in captivity as a prisoner of war. It was during this time, he said, that he dreamt of an around-the-world balloon flight. He retired from the Air Force in 1978, and began ballooning around the country and entering balloon competitions. Kittinger won the Gordon Bennett Gas Balloon Race four times during the 1980s and retired the trophy after three consecutive victories. In November 1983, he established a new world record by flying a 1,000 cubic-meter (1,308-cubic-yard) helium balloon from Las Vegas, Nevada, to New York, covering 2,001 miles (3,220 kilometers) in 72 hours. The next year, Kittinger became the first person to fly alone by balloon across the Atlantic Ocean. Setting out on September 14, 1984, from Caribou, Maine, in the 3,000-cubic-meter-Rosie O'Grady, he floated 3,543 miles (5,702 kilometers), touching down in Cairo Montenotte, Italy, on September 18, by Kittinger's account, 83 hours and 40 minutes after launch. His flight set a record for both the longest solo balloon flight and a distance record for this class of balloon. Although after this flight, his record-setting days ended, Kittinger has never stopped flying. He has piloted 78 different types of aircraft over the years and received numerous military and civilian awards and decorations. He is an aviation consultant and a barnstormer, touring around the country with his open-cockpit biplane and taking children on their first airplane rides. A person who helped open the portal to space, in the year 2002, he is still a vital part of the aviation community.